1. Select your chapter. Go here to see a list of all the chapters in the Old and New Testaments. There are 1,189 of them in a Protestant Bible. The chapters that are highlighted in yellow are already annotated. If your chapter is yellow, then you're lucky—someone has already done the research for you. If your chapter is not yellow, then you have an opportunity to share the study you are about to do with everyone else. The chapter you select is your choice. 3. If not yet done, open the chapter in the NRSV and write down the passage headings. The online text is from the American Standard Version. That version, like the King James Version, has no passage headings. We have begun to apply the passage headings from the NRSV to the text of the ASV. For example, in John 2, shown above, you see the passage heading "The Wedding at Cana." If you are annotating a chapter that does not have the passage headings, then open a NRSV bible that has them and write them down. 4. Create a preliminary set of annotations. Read the hyperlinks and extract from them concise annotations of the most important concepts, making note of the particular verse the annotation references. This step is somewhat mechanical—you copy/paste from the Fillmore resource into your word processor "snippets" of what you find. 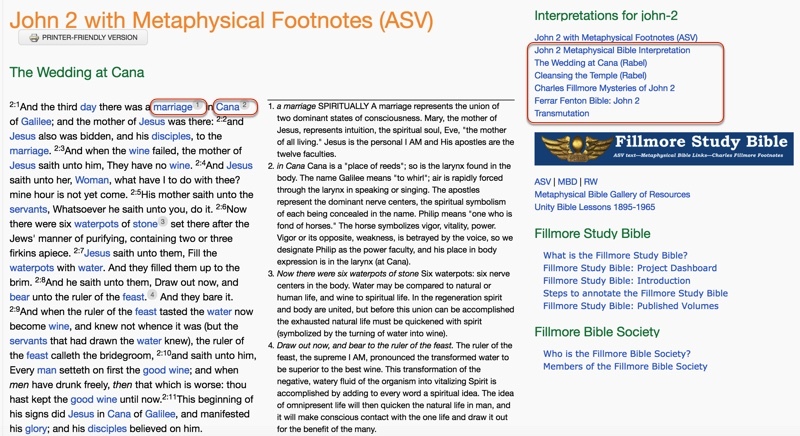 Because there are multiple hyperlinks for passages and verses, there will be duplicate annotations. The result is that a set of annotations may be from a combination of the MBD, a 1921 commentary in Unity magazine, an Ed Rabel lecture and a passage from Mysteries of John. 5. Refine the annotations for importance and for style. This step requires your judgment—your judgement of what points are most important, your judgement of how the concept should be structured so that it reads like an annotation, and your judgement of how concise the annotation should be. Try to use as much of the original text as possible but edit it so that it looks like a footnote or an annotation. For examples, see what has been done in the 21 chapters of the Gospel of John. 6. Send the annotations by email. Assemble the annotations for each passage in the chapter, noting the verse that each annotation references, and email to me at mark at truthunity.net. I prefer that you paste the entire work in the body of your mail, but you can also attach a word processing document if you wish. I will try to get your annotations posted within a few days. When it's posted, I'll send you an email to let you know and to ask you to review my posting. Sometimes I get behind in posting, but that doesn't happen too often. If I get way behind, I'll contact you.